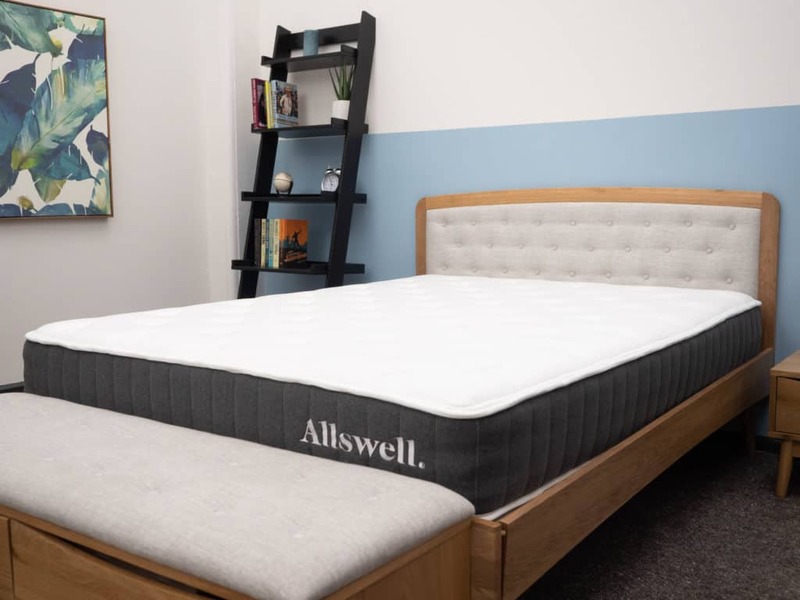 Home » Allswell Mattress Fall Giveaway! All week long, we’ve been bringing you giveaways inspired by our guide to the Best Cooling Mattresses on the market, including contests from Purple, Ghostbed, Loom & Leaf, WinkBeds, and Brooklyn Bedding. To cap things off, we’re launching one last giveaway, this time from Allswell Home. Built with a mixture of soft foam and sturdy pocketed coils, the Allswell mattress is a fantastic hybrid option for those sleepers who tend to overheat at night. I am going to have to say that the ZenHaven Mattress is my favorite! Aireloom Latex Collection Mattress is my favorite Latex Mattress! It looks like pure luxury! The Zenhaven is my favorite Latex mattress. Would Love this one, though! I think the WinkBeds mattress looks amazing. I’m a big fan of pillowtop. This mattress looks so comfy! Sounds perfect for a full night of sleep! I would have to say the Purple mattress..
Allswell would be my 1st choice for sure! Thank you for the chance to win an amazing mattress! I would LOVE to win a mattress! Both ours and our sons is all lumpy and old. I like several of the mattresses. One that I am drawn to is the Purple one. I lean more toward the Purple for myself, but I would love to give this one a try, and my guest bedroom is in desperate need of a new mattress. The Allswell is very nice. Sounds awesome…comfy and a good night sleep would be great…thank for a chance to win! Greatlooking mattress! Looks so comfy!!! Well if I don’t win (Thank your for chance) Gonna start saving up for one in the new year!!!! LOOK REALLY COMFORTABLE, COOLNESS IS A MUST, AND PLUSH MATRESS WITH MOLDING YOUR BODY BUT NOT IN ONE PLACE! It would be a blessing if I can win this bed thanks. The puple mattress is one I like! This sounds amazing…..thank-you for the opportunity !! The Leesa mattress is my favorite. Any of them would be perfect. The Zenhaven and ghost luxe were my favorite but the Allswell is right up there with them. LOVE the Leesa mattress! Love the Leesa brand!!! I have several favorites!! Each has it’s own unique contribution to my comfort!! The Allswell would be great due to it’s a firm and a cooling mattress…my back needs that!! Wonderful. I hate being hot at night. Love it!! All I need is a set of of sheets and a blanket….I am ready to jump in! The Layla is my favorite….I am a side sleeper. :-) Thank you. I like the Purple but I also like the Zenhaven mattress. Hard to decide. I’m a hot lefty! Lol as of right now I’m on the couch because my mattress is so uncomfortable…in desperate need of a new mattress, thanks for the winning opportunity! I think wink beds is my favorite latex cooling mattress so far. I think the Idle hybrid or the Avocado but any of them really sound great. Soft foam and sturdy pocketed coils! The Layla and People mattresses are my favorite. Looks like a great value! The Leesa mattress is my favorite! I really hope I win! Awesome giveaway! I believe the Zenhaven would be best for me. The leaf and loom is my favorite. The Zenhaven looks like a nice latex mattress. The ZenHaven sounds like the best fit for me. I’ve been waking up with a headache and stiff neck every morning lately. Need a new mattress so bad. I like them all but I would have to say the Loom and Leaf is my favorite. The Allswell mattress sounds perfect for living in Florida during the hot weather. I find it very interesting that they infuse the mattress with copper to keep it cool. I like the Avocado Green mattress because it is not manufactured with harmful chemicals. Never heard of the Allswell but looks awesome and the price even better sleepopolis will not steer you in the wrong direction. The Ghostbed Luxe Mattress is my favorite! Would love to win this mattress. I am going through Menopause and have Fibromyalgia and have almost continuous hot flashes!!! The Layla and the Leesa are my favorites. Thank you for the thorough and refreshing reviews you do on mattresses and pillows! It is so helpful when searching for the right product. I have been looking this mattress before. Nice! The fact that Allswell mattress has pocketed coils for airflow would make a sleeper, like me, comfortable at nights. I am most interested in the Zenhaven and the Spindle. I like the review on the Layla and the Purple mattress. The Nest Hybrid was my favorite latex mattress that was reviewed. I haven’t really looked into the latex mattress’ yet – but they do interest me. Sounds comfy! This would be a huge blessing! I need this mattress! Fantastic!